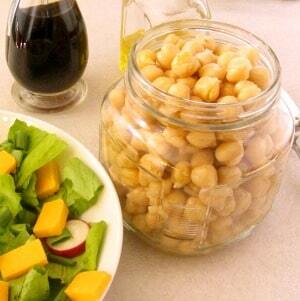 Marinate chickpeas for a flavorful addition to a salad. This easy recipe takes only five minutes, but adds so much to your meal! Every summer I write about salad lunches. I have written about the process of assembling them, and discuss the components – but I have not always given recipes for those components. Now, sometimes it’s easy – cut up some cheese, or cooked ham. Sometimes it is not quite that obvious. I use beans quite often, particularly chickpeas. You can, and I often do, just use them straight, as they are, and they’re good. 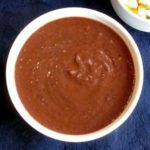 I often add a splash of vinegar to a container of beans set aside for salad – it adds flavor, and the acid acts as a mild preservative and lets you keep the beans in the fridge a day or two longer than you would without it – useful if you don’t want to eat the same thing every day but do want to cook a whole pot of beans at once. But as long as I’m adding vinegar… I started to season the beans, for more flavor and interest. I’m sure you’ve all eaten a Three Bean Salad, and it’s the same basic idea (though that mixes fresh green beans with a couple of different cooked dried beans for even more interest.) I keep this simple, though, as something I can fix quickly and keep on hand. I basically make just a little salad dressing, but with oil and vinegar ratios transposed. The beans absorb vinegar, while the oil coats them, and I think this ratio gives better flavor. And I add more seasoning than I would if I were making salad dressing. Start with a seasoning of your choice. Some kind of seasoned salt, or herbal salt-free seasoning. Mrs. 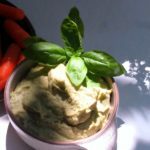 Dash, Spike, an Italian herb blend, there are many options… Put a teaspoon of that in the bottom of a small mixing bowl. Add a tablespoon of wine vinegar. I prefer to use a red wine vinegar partly for flavor, and partly because it’s then easy to see that this is the jar of seasoned beans… and not absent-mindedly put it in another recipe! I mean, it’s not as if I’ve done that… but, well, one could… (Yeah, I did that.) Mix the seasoning and vinegar. Then garlic. I never use garlic powder, I don’t like the taste, but there are times it’s handy to have a touch of garlic without the fuss (or less than a full clove, if you’re only cooking for one or two!) so I do keep minced garlic in a jar on hand. Use half a teaspoon of that – or one clove of garlic, minced or crushed, if you have fresh garlic you’d rather use. (I do both.) Then add one teaspoon of olive oil. Mix everything together well. 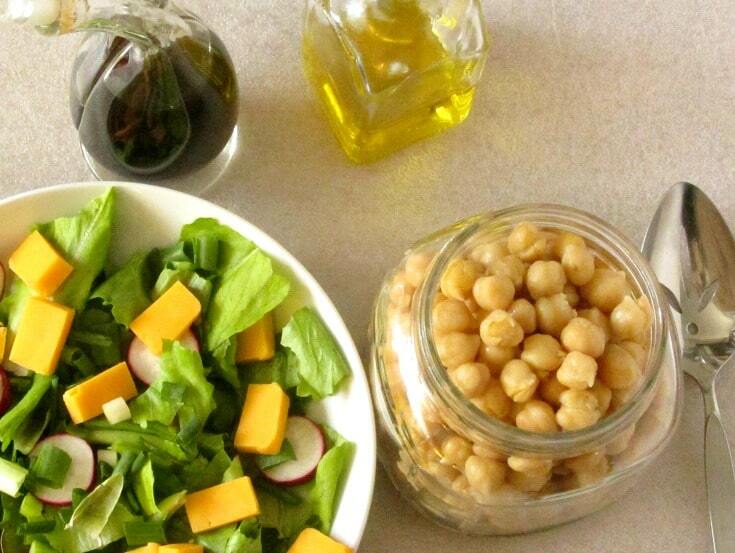 I used chick peas, which are really my favorite for salad, but you are not limited to them. Kidney beans, black beans, and white beans (navy beans, cannellini, pea beans, haricot – all closely related and interchangeable in most recipes) are all classic in this use. I see no reason not to use other whole beans either, if you like… I don’t see anyone turning down pintos or favas! Let them marinate at least a few hours – a day is fine. If you make enough to last three or four days they’ll just pick up that much more flavor from the dressing. 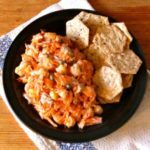 Use them in a salad, serve them on the side, put them out on a buffet… A flavorful, versatile recipe that takes all of five minutes! 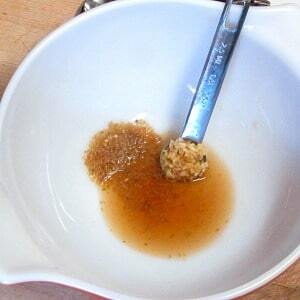 Mix the seasoning and vinegar in a bowl to moisten the seasoning. Add garlic and oil, stir well. 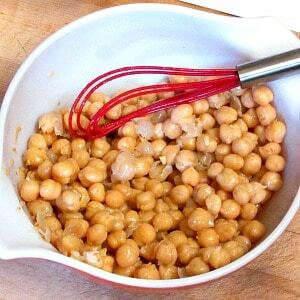 Add chickpeas, and stir well to completely coat with the dressing. Refrigerate several hours before serving. The five minutes is preparation time - while you can eat them at once, I recommend letting them marinate for several hours or longer. It will hold well for several days in your refrigerator. 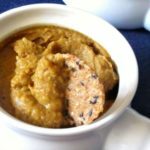 I love chickpeas and try to incorporate them in any recipe I can. I'm looking froward to giving your recipe a try. It looks like the perfect sunner salad! Oh, I do, too! Between the flavor and the firm texture, I use them in so many ways! Do try this - the marinade just adds that extra lift to make it special! And enjoy it! I just discovered chick peas and I love them. This is great! I never thought about marinating them. Aren't they delicious? Yeah, I put them in salads plain for years - and make no mistake, that's good. (I still sometimes just do that.) But if I can add this much more flavor in just five minutes - well, why wouldn't I? Enjoy them! Oh i love chickpeas and this one looks so yummy! Going to try it out. Lovely! I do, too... Enjoy it! 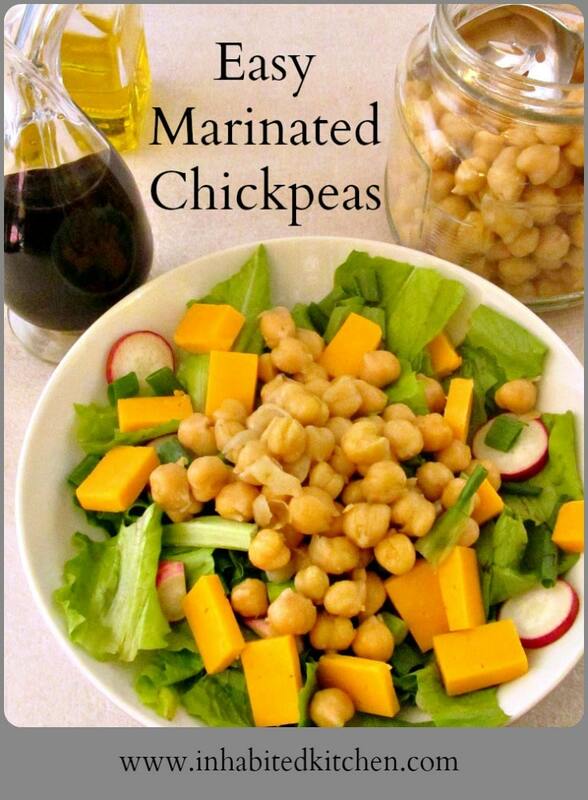 I love using chickpeas but have always found them too bland to add to salads on their own. I think your recipe has solved that problem for me! Oh, I hope so! Thank you! I do like them on their own, but also enjoy the added flavor. I love putting chickpeas on salad. What a great idea to marinate them!